Organized by University Libraries and including a special display of the late Professor Emeritus Wilbur Zelinsky’s books and maps, including some available to take. The Local Foods Study for Carolyn Fish’s Human Dimensions of Natural Resources and the Environment course was a success with had more than 70 participants from the State College community who came and shared their views of local foods. Several geography graduate students were helpful in setting up and taking notes during the event. The Gould Center also provided funds for this outreach event with the goal of better understanding State College residents perceptions of local foods and specifically the spatial extent of where their local foods come from. Sterling Quinn passed his dissertation proposal defense, and last Saturday he gave a talk titled “The State of OpenStreetMap in South America” at the State of the Map conference in Buenos Aires. Jenna Christian was awarded a $2,000 research grant from the Africana Research Center at Penn State for her ongoing dissertation research on “Militarized Youth: Citizenship, Soldiering, Incarceration, and Young People’s Futures” in Houston, Texas. Benjamin DeAngelo (B.A. ’92) was recently on the U.S. delegation that took part in the government approval of the IPCC Synthesis Report of the 5th Assessment. Nathan Piekielek (B.S. ’00) was hired as the University Libraries Geospatial Services librarian. The USGS Century-of-Trends project seeks to quantify century to multi-decadal trends in the concentrations and loads of nutrients and carbon in US rivers. Proper analysis of long-term trends required developing a basic understanding of the major periods of water quality development in the U.S. The first half of this presentation focuses on broadly describing the evolution of water quality in the US since the late 19th century. The second half presents trend analysis for nitrate and alkalinity in U.S. rivers using data from the USGS, state agencies, municipalities, and other entities. The utility of using major ion ratios to discern watershed acidification processes will also be presented and discussed. A late addition to the fall line-up, this coffee hour will not be webcast and there will be no student-organized reception beforehand. Faculty and staff are invited to learn and share effective uses of technology to enhance teaching and learning at the free 2015 TLT Symposium. The Symposium will take place on Saturday, March 21, 2015 at the Penn Stater Conference Center Hotel, University Park. There is no registration fee and a continental breakfast and lunch will be provided. The TLT Symposium is an excellent opportunity for you to share with the Penn State community the innovations in educational technology that have been explored over the past year. Faculty and staff can submit proposals to present on these innovations using the online form at http://symposium.tlt.psu.edu/proposals/. We are especially interested in sessions that illustrate how faculty and students are embracing new ideas and approaches to create innovation in teaching and learning. These sessions can be individual presentations, group presentations, panel discussions, or hands-on workshops. Each session should include some discussion of practical aspects such as the tools used, sources of support, best practices, and how the application of technology can be transferred to other disciplines. The deadline to submit proposals is November 24, 2014, and notification of acceptance will be made no later than mid-January 2015. Those submitting proposals may also register for the event at http://tltsym15.eventbrite.com or by selecting the “Register” button at http://symposium.tlt.psu.edu/. For questions on the proposal submission form and registration, please email tltsymposium@psu.edu. For more details on the Symposium, including information on keynote speakers who will be announced soon, please visit http://symposium.tlt.psu.edu/. The Symposium is sponsored by Information Technology Services and the Center for Online Innovation in Learning (COIL). Ever since the natural gas boom took off in Pennsylvania in 2006, some people living near the drilling rigs have complained of headaches, gastrointestinal ailments, skin problems and asthma. They suspect that exposure to the chemicals used in the drilling practice called hydraulic fracturing, or fracking, triggers the symptoms. But there’s a hitch: the exact locations of many active fracking sites remain a closely guarded secret. While flying over the border between Mexico and the United States, an astronaut aboard the International Space Station photographed these sister cities on the Rio Grande. The image shows the second largest metropolitan area (population 2.7 million people) on the Mexico–U.S. border. 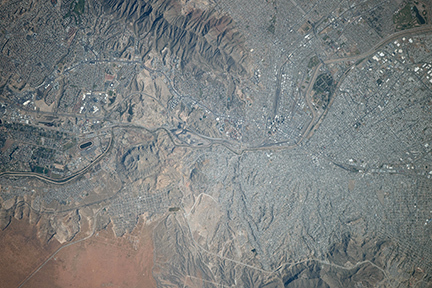 The centers of El Paso and Ciudad Juárez (image top right) lie close together on opposite sides of the Rio Grande, and large residential areas cover the arid slopes in the rest of the scene. The river crosses the entire image as a prominent line and acts as the international border. (Note that north is to the left in this image.) A large, elliptical race track appears on the far left. Send your good news to share to geography@psu.edu. The origin stories that surround geographic information systems focus in on the 1960s, as a period of intense advancements in computer-supported cartography. In this presentation, I examine one site of such innovation: the Harvard Laboratory for Computer Graphics (and Spatial Analysis), founded by Howard Fisher in 1965. By examining the growing interest and expansion of computational methods in the analysis and representation of spatial data, I reconsider and rescale what we might mean by innovations in digital mapping. GIS Day, the annual, worldwide salute to geospatial technology and its power to transform and better lives, is coming to Penn State on Wednesday, Nov. 19, during Geography Awareness Week, Nov. 16 to 22. The University Libraries and the Department of Geography are co-sponsoring the event to raise awareness of geospatial information, the many possibilities and opportunities of geographic information systems (GIS) and activities related to GIS at University Park. Researchers in the US propose yet another way to reduce greenhouse gas emissions, and at the same time prevent soil subsidence − by preserving and even restoring the world’s wetlands. Jaclyn Hatala Matthes, a geographer at Dartmouth College in New Hampshire, US, reports in the journal Global Change Biology that she and colleagues from Californian universities measured carbon dioxide and methane from a pasture, a cornfield and a flooded rice paddy, all in the Sacramento-San Joaquin delta in California, which was drained more than a century ago and was settled for agriculture and human habitation. Since July, more than 20 million Facebook users added posts, comments and other messages about this week’s elections. The social media company analyzed the data, placed the messages into categories and shared the findings with The Wall Street Journal. These maps show several of those categories by congressional district, with darker shades representing proportionally more discussion. Search the maps to find your city or state. Bernhardt earned a spot on the regional team that will compete for the World Geography Bowl title at the AAG meeting in Chicago this spring. – MGIS students Erin Goodnough and Marnie Sippel presented their capstone projects at the meeting, supported by faculty advisors John Kelmelis (Ph.D. ’91) and Doug Miller. What are the effects and implications of persistent desires to make and celebrate hero figures in environmental justice struggles? This talk draws on 18 months of research amidst forest conservation interventions, afforestation “land grabs” and illegal timber trading in the woodlands of Zambézia, Mozambique. A group of local woodland residents and other competing actors become new hero figures in woodland and other spaces, appearing to signify much-needed progress in a broader decolonial and feminist project of displacing paternalistic white saviors and solemnly remembered war heroes. What effects does this shift and transformation in making and unmaking hero figures have in the forest and in the ways we understand the political ecologies of woodland landscapes and activism. Note: This talk will be available live (via Mediasite) only and will not be archived. The Penn State women’s soccer team won its 16th Big Ten Championship and third outright title in four years, thanks to second half heroics by senior Kori Chapic on Senior Day Sunday (Oct. 26) afternoon. Also earning a career-best mark is geography undergraduate Britt Eckerstrom (16-2-0), who posted her 16th win of the year. She made three saves in the victory. See also: No. 7 Women’s Soccer Wins Big Ten Championship: Kori Chapic and Britt Eckerstrom set career-marks in the win. Has technology changed our perception of distance? A recent article in The Economist analyzed whether the Internet has “eliminate[d] geographical differences” as some experts predicted it would. In a Directions Magazine podcast, editors Joe Francica and Adena Schutzberg discuss the article and consider the impact of GIS technology. The editors of the International Journal for Service Learning in Engineering, Humanitarian Engineering and Social Entrepreneurship (IJSLE) are pleased to announce publication of the Fall 2014 issue. To view this issue of the Journal, please log on to www.ijsle.org.